Set in the picturesque city of York, in North Yorkshire, York racecourse is one of the UK’s top racecourses attracting hundreds of thousands of racing fans annually. The city is steeped in history and that history extends of horse racing, with races in nearby Forest of Galtres that can be traced back as early as 1590, and to this actual racecourse in the 1730s. 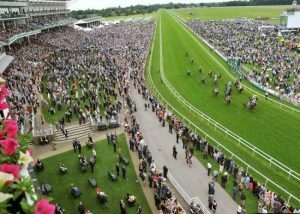 York racecourse hosts three of the yearly group one races ( Juddmonte International Stakes, the Nunthorpe Stakes and the Yorkshire Oaks) as well as the ever popular Ebor Handicap, which has £500,000 prize money and takes place in August of each year. Also taking place in August as part of the same Ebor Festival, The International Stakes, for three year olds and over, has been won by such giants of racing as equine icon Frankel in 2012 and Roaring Lion in 2018. The racecourse used to have a distinctive horsehsoe shape to it, but in 2005 it was extended and is now a full round course. The change took place on account of the Ascot Gold Cup moving to York for that particular year due to redevelopments taking place. York racecourse regularly places highly in Favourite Racecourse polls.